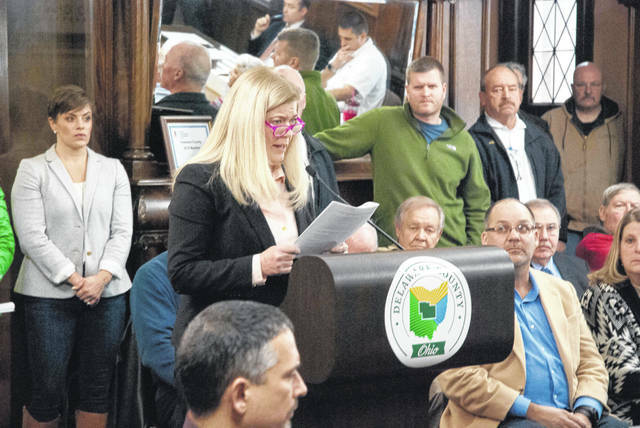 All eyes were on Liberty Township Trustee Melanie Leneghan as she spoke during Thursday’s Delaware County Board of Commissioners meeting. Leneghan said she sees partnering with the county EMS as a significant opportunity for both the county and township. In an emotionally charged discussion Thursday, Liberty Township residents asked the Delaware County Board of Commissioners to rescind the county’s proposal to take over the township’s emergency medical services (EMS). Commissioners Gary Merrell and Jeff Benton walked away, leaving the proposal on the table after their regularly scheduled meeting when neither would second a motion made by Commissioner Barb Lewis to rescind the original resolution sending the proposal to the Liberty Township Board of Trustees. Lewis also asked for a second to a motion to form a task force to study the EMS situation, but she did not receive one from Merrell or Benton. After an executive session Monday, commissioners took action, voting 2-1 to pass a resolution authorizing the county administrator to present the county’s EMS proposal to Liberty Township’s board of trustees. Benton brought forth the motion on Monday for a resolution to move forward with the proposal, which was seconded by Merrell. Both then approved the resolution, setting the proposal in motion, while Lewis adamantly opposed it. Sue Braden, a Liberty Township resident who was sitting in the front row Thursday, pointed out to Merrell that he was quick to second Benton’s motion on Monday to send the proposal to the trustees, but not to second either of Lewis’ motions, which would slow down the process of the county taking over the township’s EMS. According to Liberty Township Trustee Shyra Eichhorn, Township Administrator Matt Huffman received the proposal Wednesday from Mike Frommer, Delaware County administrator, who sent it on to all the trustees. Lewis said the proposal should be withdrawn until a task force could be formed, because if Liberty approves the proposal, 15 to 18 cross-trained fire/paramedics would be laid off. All three township trustees attended the Thursday meeting, but only one formally spoke to the commissioners in an official capacity. Schuiling, however, said Thursday he had met with Lewis on three separate occasions. Leneghan said she sees partnering with the county EMS as a “win-win” with “opportunities for improved service levels” for both the county and Liberty Township. Frommer asked Schuiling to attend the meeting to provide some answers about the county EMS. Schuiling went on to present several of the county EMS awards, accolades, and certifications from nationally recognized EMS and ambulance associations as a way to establish his statement of “100 percent above board.” He then fielded questions from the Liberty Township residents. One of those many questions came from Shyra Eichhorn, Liberty Township trustee, who said she didn’t challenge the level of care the county EMS provides versus what the township’s EMS would provide. She said she challenged the national standard of only two paramedics per ambulance over Liberty Township’s standard of three per ambulance. Schuiling told Eichhorn that “a two-paramedic ambulance offers the highest level of efficiency to the constituents of Delaware County.” He also assured her that all Delaware County residents would receive the same level of care from his department. Braden, who was standing at the lectern at the time said, “they will,” to Merrell’s last comment of the board accepting the current proposal as is. Merrell then said it would come back to the commissioners for their evaluation on if it’s in the best interest of the county and the township. “We’re far from getting that resolved,” he said. Frommer explained what the chain of events would be like if the trustees accepted the proposal. He went back to July when the county sent out the Fitch report to every township to get feedback. Frommer said the county was invited to present the Fitch report, and at that time, two of the trustees asked for a proposal. He said he went back to the county to meet with Schuiling and the commissioners for input. Frommer mentioned the county did a similar agreement with Sunbury for sewer, and that it took a year to complete. Tom Homan, Delaware City manager, also attended the Thursday meeting. He said there is no shortage of studies on how to approach the subject of funding the multiple EMS services in the county. Liberty Township Trustee Mike Gemperline did not take the opportunity to speak Thursday. This entry was tagged Barb Lewis, D. Anthony Botkin, Delaware County Commissioners, Delaware County EMS, Gary Merrell, Jeff Benton, Liberty Township, Melanie Leneghan, Mike Schuiling, Shyra Eichhorn. Bookmark the permalink.